Mosquitoes are a bane to all campers. They can carry disease, they itch, they buzz, they squish, they swarm, they even get in your ears and eyes. I love the first frosts in the fall. Camping in late September and October is my favorite time because the bugs are usually gone. The cold weather takes care of the little pests until the warmth of spring. Plus, humidity and heat tend to be lower. One would think that at 10,000 feet up a mountain, where trees are sparse, the air is dry, the wind continually blows, and there is frost some mornings in July, a respite from the bloodsuckers could be had. But, no, No, NO!!! The skeeters were thicker and more aggressive than any lowland Minnesota mosquitoes. The only difference is that they were out earlier in the day and laid low once the temperatures dropped with the setting of the sun. This trek was the first time I've resorted to using mosquito netting, but it did a great job - and what a fashion statement, isn't it? 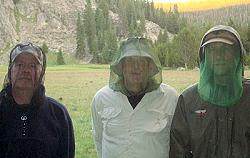 For thick mosquitoes, wearing long loose-fitting pants and shirt, plus a head net works a lot better than bug repellant. Light nylon pants like the BSA zip-offs work well. Just be careful when you sit and the fabric is pulled tight against your skin because bites can go right through.